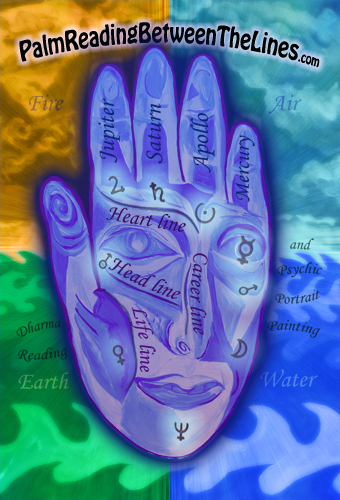 Treat yourself to a Palm Reading and reflective Portrait that reveal unseen aspects of your Self most relevant to your life right now. Experience transformation as Deborah reads and then paints from a meditative rapport with you. Guided by Deborah's clarifying psychic perception, you share a higher view and a personalized language, enabling you to see beyond your familiar Self, encouraging your highest potential. Deborah practices traditional methods of interpreting the palm lines, and also intuits invisible gifts of wisdom, "reading between the lines". Newly discovered aspects and symbols appearing in the reading are then rendered into a profound portrait of your ecstatic self on canvas. Deborah has performed accurate palm readings for 20 years, utilizing both Buddhist Wu Hsing and European Cheirological analysis. Her painting influences include Impressionism and German Expressionism. She has a BFA in painting and has practiced portraiture for 40 years. 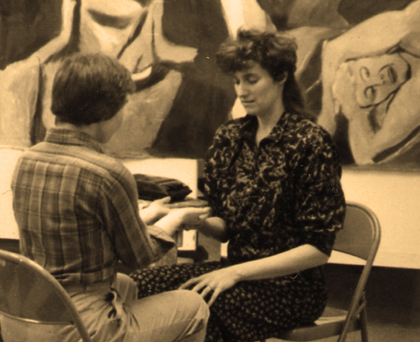 Deborah Moore palm reading, CCAC Art Fest, 1986 See some example Palm Portraits, read about how they were produced, and learn a bit about the people whose palms were read. Gallery of palm reading portraits. Or see Deborah's entire painting collection, starting with her very first works in the early 70s. 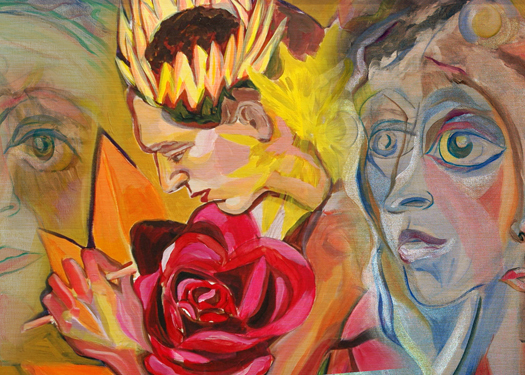 Find out how her figurative paintings reflect the vision and quest Deborah shares with models and viewers.